On Wednesday, Nigeria's president, Muhammadu Buhari, and his deputy, Yemi Osinbajo, appeared at a town hall discussion forum organised by Daria media, in partnership with the Nigerian Television Authority (NTA). The event, anchored by ace journalist, Kadaria Ahmed, was aired live on NTA and other affiliated stations. It is part of a series Ms Ahmed is organising for presidential candidates and their running mates for the 2019 elections. 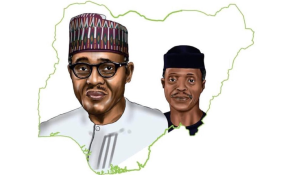 Messrs Buhari and Osinbajo appeared as candidates of the ruling All Progressives Congress (APC) and were drilled on what they plan to do for Nigerians, if re-elected. While Mr Buhari largely parried questions directed at him with witty, indirect responses, Mr Osinbajo engaged the audience more, with figures and statistics. PREMIUM TIMES highlights some of the claims made by the duo during the town hall event. CLAIM 1: As of 2012, Nigeria had 112 million people living in extreme poverty. While speaking on Nigeria's poverty index and how the nation was ranked the 'poverty capital of the world' last year, Mr Osinbajo said as of 2012, Nigeria had 112 million people living in extreme poverty. Today, he said, Nigeria has about 86 million people who are poor but it is higher than India, adding that the nation has done immensely well in lifting people out of poverty through its poverty alleviation programmes. In March 2012, the National Bureau of Statistics said about 112million Nigerians are living below poverty level, according to the bureau’s poverty report. The NBS added that the figure represented about 67.1 per cent of the country’s total population of 167million at the time. The report came amidst revelations that the country’s real Gross Domestic Product (GDP) growth rate recorded a marginal rise from the 7.40 per cent in Q3 2011 to 7.68 per cent in the last quarter of 2011. Economists, however, argued at the time, that the growth was ‘exclusive’ as it never translated to improvement in the lives of Nigerians. More Nigerians slipped into poverty at the time, according to reports. CLAIM 2: Okonjo Iweala warned about recession as far back as 2012/2013. Addressing why the nation slipped into recession even when the government inherited a 'growing' economy, Mr Osinbajo said there had been signs of looming recession before the government took over power. He specifically said a former finance minister, Ngozi Okonjo-Iweala, warned of a looming recession as far back as 2012/2013. In June 2012, Mrs Okonjo-Iweala, who was also co-ordinating minister of the economy, warned that "government should buckle up and prepare for a possible recession" in the economy. The minister, at the time, added that the nation must put measures in place to avoid recession, citing the slide in the price of crude oil as well as the dire economic situation as signs of things to come. "Nigeria may not be so lucky to avoid recession this time as it did during the last economic meltdown and urged the Federal Government to put up measures that will help mitigate the effect of such economic meltdown," Mrs Okonjo-Iweala was quoted as saying. Still commenting on the state of the economy, Mr Osinbajo said Nigeria has no debt-to-GDP problem as the nation has one of the lowest in the world. He added, however, that Nigeria faces a debt-to-revenue issue. Verification- In May 2018, the immediate past finance minister, Kemi Adeosun, said the nation’s debt to GDP ratio stood at 21 per cent. By the end of the year, it is believed to have risen to 24 per cent. Although many experts have expressed fears about the nation’s rising debt profile, Nigeria still has one of the lowest debt-to-GDP ratios in the world. Some of the countries with highest debt to GDP ratios globally are Japan, Greece, Lebanon, Italy, and Portugal with 253 per cent, 178 per cent, 149 per cent, 131 per cent and 125 per cent, respectively. The United States, according to Trading Economics, has 105 per cent while France has 97 per cent debt to GDP ratios. Congo and Egypt, two African countries with high debt to GDP ratio, recorded 117 and 101 per cent, respectively. On the flipside, as Mr Osinbajo claimed, while Nigeria’s debt keeps rising in the face of dwindling revenue, many have expressed worries over its debt to revenue figures. In November 2018, partners at PwC and KPMG warned the nation about its debt to revenue figures. Adegoke Oyelami, a partner at KPMG, warned that with a debt of N22.2 trillion, the nation will be in dire straits servicing the debt in the next five years. But, to allay the fears of Nigerians about the nation’s debt status, Mr Osinbajo added that Nigeria is not in any danger as most of the debt accumulated are local debts. Most debt is in naira because it’s in treasury bills, the vice president said. In September 2018, the Debt Management Office announced that Nigeria’s external debt rose to $21.591 billion as at September 30, while domestic debt rose to $40.107 billion and $11. 514 billion for the federal government and state governments, respectively. The figure showed that Nigeria’s total debt stock rose to a new high of N22.428 trillion ($72.213 billion), from N17.36 trillion ($56.73 billion) at the end of 2016. The local debt is however higher than the external debts. CLAIM 5: Nigeria is practically self-sufficient in rice. Still on the economy, Mr Osinbajo rehashed the administration’s signatory tune on rice production and food sustainability. According to the vice president, Nigeria is practically self-sufficient as it produces about 90 per cent of the rice it consumes. It is not the first time Mr Osinbajo would make this grossly exaggerated claim, together with Mr Buhari and Agriculture minister Audu Ogbeh. As PREMIUM TIMES fact-check has shown, the government’s rice programme, the Anchors Borrowers Programme (ABP), may have encouraged increase in local production of rice but it is dogged by numerous allegations of fraud and malpractices, many of which slow down its potentials. Besides, Mr Osinbajo’s claim of 90 per cent sustainability is not supported by verifiable data. Rather, a PREMIUM TIMES fact-check has shown that a criminal surge in smuggling of rice from neighbouring countries like Benin, rather than improved local production, has accounted for the supposed ‘sustainability’ in local consumption. As per the reduced import figures, the CBN policy on access to forex for importation of rice has been a contributing factor. Verdict: The Claim Is At Best Misleading––And At Worst, False. Toward the end of the event, Ms Ahmed asked Messrs Buhari and Osinbajo about the disability bill transmitted to the executive by the national assembly last December. From his countenance, Mr Buhari apparently knew nothing about the existence of any such bill. “I think we sent to the national assembly,” Mr Buhari said. “They returned it to you,” Ms Ahmed responded but the vice president quickly intervened, saying he is not aware of that. First, the vice president’s claim that the executive has not received the bill is MISLEADING as virtually every national newspaper reported that the bill had been transmitted to the presidency in the third week of December. Checks by PREMIUM TIMES revealed that there are no rebuttals by the presidency notifying the public that it did not receive the bill as claimed by the national assembly. Again, the vice president’s claim that there was a demonstration “as of Wednesday” is FALSE. Checks by PREMIUM TIMES revealed that no such “demonstration” was reported anywhere penultimate Wednesday. In actual fact, the last time any demonstration was staged as regards the bill was on October 10, 2018, two months before the bill was finally transmitted by the national assembly and three months before the town hall event held Wednesday night.